Two of Riverside’s finest have come together to combine technology and the Marvel universe for an event unlike any other. 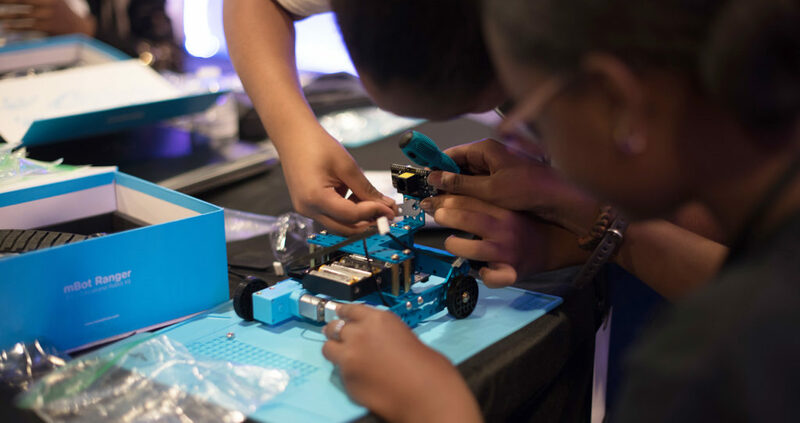 Kevin Carrington and Ralph Richardson have created the C3 Expo which allows local African-American youth to learn about technology in a fun and imaginative way. “The three big ideas for C3 are the culture of technology, teaching kids how to code and leadership,” said Richardson. Entrepreneur, businessman, innovator and nerd, these are all the phrases that come to mind when thinking about Riverside’s own Kevin Carrington. Carrington originated the idea of the C3 Expo in Riverside and has had a long-time passion for black youth to become familiar with computer programming. By working with major tech companies, including Esri, an international leader in Geographic Information System (GIS) software technology, Carrington and Richardson help show kids a plethora of opportunities through computer programming. “I wanted to get kids excited about computer programming, so I started the C3 Expo to give them an opportunity to do just that,” explained Carrington. The previous C3 Expo, which occurred last October, gave young minds a chance to have hands-on experience in coding which led to the launching of a mini-rocket. “People have this misconception that computer programming is just sitting at a computer all day… I wanted to show how, if you give something like a rocket a command to launch in code, the rocket would follow it,” said Carrington. In the grand scheme of things, Carrington plans to funnel the same youth attending his expos, back into the companies that sponsor the event. “I tell the big tech companies that sponsor the C3 Expo to invest in African-American youth and…they won’t be disappointed…they’ll produce great results,” he added. Carrington’s passion to help Black youth see how technology is the future came from his own humble upbringing in the Eastern region of the United States. Originally from Brooklyn, New York, he and his family moved to Atlanta, Georgia to have a better opportunity for business. His father was initially going to school to become an electrician but he would soon open his own business and did contracting for DirecTV and Dish Network. “Entrepreneurship runs in our family with my father being one, his mother being one and even my great-grandfather owned his own business,” mentioned Carrington. Carrington adopted that hard-working ownership mentality as he and his brother would take on completing tech orders customers brought into his father’s shop. Not only was Carrington’s father selling and installing for Dish Network and DirecTV, he was also a technical repair mechanic. “I remember having to finish all of my homework at school and then once my father picked me up, we headed to his shop and that’s where I was introduced to technology,” said Carrington. After much time working at the shop, Carrington soon got his hands on a personal computer and realized it was the future as he fixed different software issues. At Greater Atlanta Adventist Academy, Carrington was a very involved student. He was a member of the chess club and became captain of the varsity basketball team. “No one could ever identify me with one specific group of people in high school since I was an all-around type of person,” said Carrington. Upon graduating high school, Carrington went on to receive two bachelor degrees in Marketing and Computer Information Systems from Oakwood University. Soon after, he got the opportunity to intern at Northrop in Alabama—one of the largest global engineering companies in the world. Following his post-graduation success came anguish when his father passed away one week after Carrington received his two undergraduate degrees. “That was a rough time for me and I wasn’t happy with my learning and internships…people kept telling me that business was really my forte,” he explained. With that in mind, Carrington came to California, and opened a handful of small businesses, including Carrington Case, which creates accessories for Apple products. “Carrington Case was actually a happenstance, but I wanted to make cases for the achiever,” he explained. It is never just one person behind leading the charge, big events like the C3 Expo requires teamwork which is why Richardson is so important to the event. He is a native of the beautiful island of Bermuda where he spent most of his life up until 2001, when he moved to the United States. “When I came to the United States I was going to school for finance, and actually became a banker but realized it wasn’t my passion,” mentioned Richardson. He got into technology and started his first company, Maven. Maven was a digital creative agency looking to expand digital products for corporate entities and startup websites. “I’m currently trying to pursue real estate and other things, but Maven definitely helped me become an entrepreneur,” said Richardson. He went on to work with cities like Loma Linda and Riverside’s Office of Education. He played a big part in these entities earning accolades such as the Gold Award and Best in Show. He also joined a technology agency known as Riverside IO, where people come together to collaborate about programming and design. “The two main goals of Riverside IO are not only to get tech people to meet, but also to work together on projects in a learning space,” Richardson stressed. The generosity of UCR made this agency possible by donating a 5,000 square foot office space for these people to work. This agency is also where Richardson made a connection with Carrington. They had the same interest in technology and youth. “At the time I was Chairman of the Board at Riverside IO and I really got to know Kevin from working very closely with him,” Richardson stated. Carrington introduced the idea of the C3 Expo to Richardson and they began building from there, not realizing how grand these events would become. He and Richardson hosted their first C3 Expo for 2018, on February 18. It featured the use of actual robotics which upped the ante from last year’s Expo. Richardson held classes on Friday evenings for some students to train and prepare to teach other youth during the event. “The vision of this whole expo is to get local tech companies to connect with minority youth in the city,” Richardson added. Like the last event, the February 18th session had a Marvel theme to spur interest and specifically focused on the Black Panther movie which hit theaters February 16th. “If Africans had the ability to create and advance in technology, Wakanda is what it would look like,” said Carrington. This was in reference to Stan Lee’s purpose behind the story that focused on an African society adept at using very advanced technology. 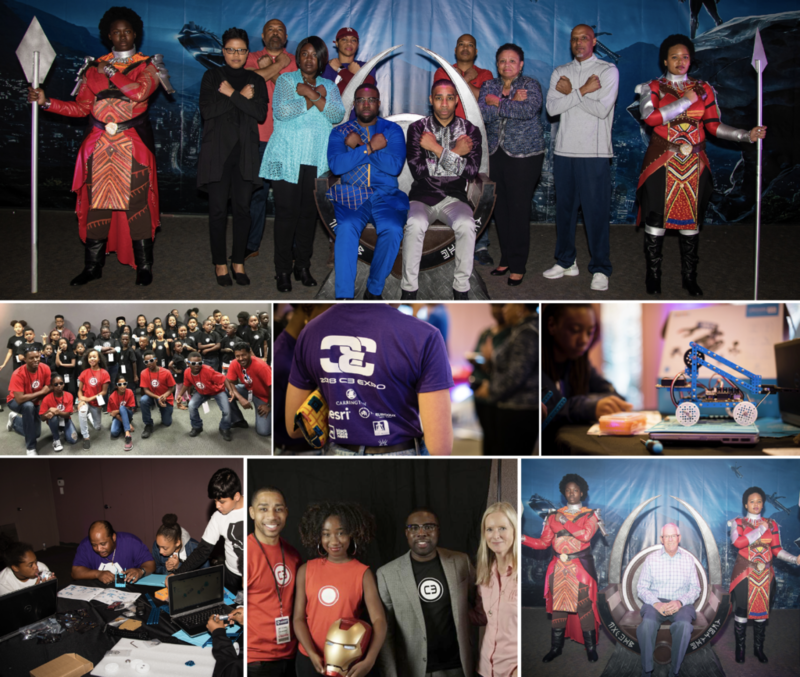 African-American youth learned a lot at the recent C3 Expo with the help of Esri’s generous donation of 81 laptops for coding purposes. “It means the world to me that Esri would the value in African-American youth…I was sold that,” explained Carrington. Esri’s generosity and support extends beyond hardware. One of the company’s Account Managers, Jan Cunningham has been personally involved well. “Jan helped out a lot by doing all of our color printing and even bringing out a keynote speaker the kids,” explained Richardson. Carrington is an avid user of the GIS mapping technology Esri provides. He uses Esri data geographically identify retailers in regions have a high density of his target consumers. “As Administrator at Loma Linda University Health’s Neuropathic Therapy Center, I use Esri data to assess and evaluate patient populations in deciding the location for clinics,” stated Carrington. The C3 Expo initiative is working in alignment with Mapping Black California, a collaborative community mapping project. Mapping Black California is designed to bring together technology, data, geography and place-based study to better understand the state’s African-American community while at the same time, building technology related capabilities in African-American youth. Esri’s founder and President Jack Dangermond and his business partner and wife, Laura, support the Mapping Black California Initiative. The collaborative initiative is led by Paulette Brown-Hinds of Voice Media Ventures/Black Voice News, and Geographic Information Systems/Mapping innovators’ Esri. “[The Mapping Black California Initiative] is overdue…creating a timeline for African-American youth is great,” Carrington stressed. Carrington and Richardson believe this combined effort will create a future that Black youth in inland area would have never expected.